The start of the summer does not just mean the arrival of thousands of tourists cramming into hotels and beach bars. It is also a time when many homes which have been shut up all winter come to life. There are around 160,000 tourist properties on the Costa del Sol and, when they are all occupied, the town councils along the coast have a hard time meeting the demand for utilities. For instance around 40 per cent of the total amount of refuse produced on the coast all year round is created in the summer months. Water consumption doubles and the use of electricity shoots up. But there is more. The supermarkets have to take on extra staff, it is high season for gardeners and the postmen have to work harder. However it is the water companies that notice the rise in the population the most. The opening up of homes that are closed during the coldest months means that it is not only the domestic consumption that rises but the use of water for gardens too. Juan Cañete of Acosol (the company supplying water between Manilva and Torremolinos) explains that in high season consumption doubles. “Fortunately the reservoirs are full and there will be no problems”, he comments. On the other side of the coast, Axaragua supplies almost double the volume of water in the hottest months that it does in the winter. Whereas the rest of the year a million cubic metres leave the reservoir every month, in August the figure shoots up to 1.9 million cubic metres. 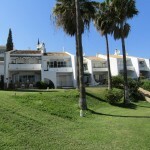 Moreover, in tourist resorts such as Torrox and Torre del Mar, consumption goes up by between 70 and 100 per cent. The staff at refuse dumps also have more work at this time of year. The amount of rubbish goes up and the number of street-cleaning staff has to be increased. Juan Antonio Sánchez, the person responsible for the Environment and Refuse at the supra-municipal entity, the “Mancomunidad” of Municipalities on the Western Costa del Sol, says that at the Casares waste disposal plant the number of work shifts is doubled to make sure that refuse does not pile up. In a municipality like Marbella alone the amount of rubbish produced reaches over 12,000 tonnes at this time of year. “The refuse created in the summer represents 40 per cent of the total for the whole year”, he comments. The consumption of electricity also goes up at this time of year. The arrival of thousands of visitors forces the company to step up the supply of electrical energy to meet the demand, especially on the hottest days. Even so there are occasionally breakdowns (as happened a fortnight ago in Seville) when the electricity is cut off and no electrical apparatus can be used, not even the much needed air conditioners and fans. The commercial director at Sevillana-Endesa, José Antonio Ruiz Guerra, explains that this summer figures of 1,200 megavolt-amperes (mva) may be reached, when the rest of the year it is not normally over 800. Ruiz Guerra says that during the summer months the company steps up the number of people on duty at any one time, although the important thing is not solving incidental problems but extending the whole network of cables and increasing the supply so that there are no hitches, a philosophy that could well be applied to the water supply and refuse collection on the Costa del Sol too.